This is going to be another post on how to reduce acne. If you haven’t checked already read how is acne caused and how to cover acne withmakeup. In this post I will tell you how to use hydrogen peroxide for acne and tell you about how effective it is. It’s simple peroxide which is usually used for personal hygiene and first aid at home. 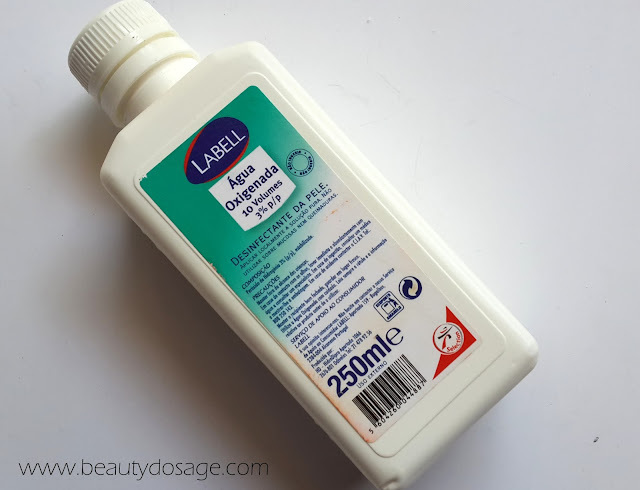 You can find a 500ml of this solution for as cheap as $0.60 in drugstores. The main uses are treating wounds, removing stains off clothing, whitening teeth and so on. What the solution does is basically kills the bacteria around the applied area causing an infection or stain. This is why it usually bubbles when applied on wound or dirty object. How is Hydrogen peroxide used on Acne? Not many people are aware of it but if your acne is caused due to dirt clogged up in your pores, this solution can definitely help. However, keep in mind that you should use the solution on concentration not more than 3% using something higher is harmful to your skin and can cause burns and extremely dryness and worst cases make your acne condition worse. As it kills bacteria, it’s most likely that your skin will get a little dry so be sure to apply moisturizer afterwards. You can find 3% Hydrogen peroxide in pharmacies and supermarkets for extremely cheap prices. It’s definitely likely that in some places you won’t find this solution as low as 3% in this case DO NOT settle for a higher percentage and use it. I have tried diluting it with water as well but I find its still extremely drying compared to using a 3% solution. 3% hydrogen peroxide is readily available at drugstores which are what you should be using for acne, whitening teeth etc. Any grade higher is used for other purposes other than beauty. How to use hydrogen peroxide on acne? Use only 3% with a cotton swab and apply on the affected area as spot treatment. You can use as a toner but I find this extremely drying. Your face should be cleansed nd exfoliated prior to this application. Follow up with your normal moisturizer. This is a must although 3% hydrogen peroxide is the lowest you can find it’s still peroxide so it will cause drying. If your acne is due to hormonal changes, it’s likely that this will not work as the cause of your acne is not clogged pores. Note: use this at your own risk. If in doubt consult your doctor. Use only 3% for treating acne. Want more posts on how to reduce acne? Read here. Hope this helped you find a few answers regarding the use of 3% hydrogen peroxide. Wow I didn't know the benefits of the hydrogen peroxide, good post! I didn't know the benefits of hydrogen peroxide, good post!